Microsoft SharePoint is a platform for developing intranets. It supports many features such as CMS, news, employee directory, team collaboration areas, websites, wikis, and personalization. Some Microsoft SharePoint intranets are absolutely wonderful — rich with features that help the business and engage employees, with easy navigation, improved search, and with page designs that influence users to check all the content. Basic navigation that is easy to identify because of the apt use of background color and the location. Improved visibility of regularly utilized applications, pages, and websites. A merry go round with announcements, promotions and other extraordinary stories. A wide, fat footer at the bottom of the sites that display global topics and the links in the main menu. Content related features such as highlights of the project to create an awareness among employees on core activities and objectives; and employee features, committed to promoting activities that are related to employee life. Installing SharePoint is just the beginning. To have an awesome intranet, you should have an excellent UX design and development. Don’t be driven or tricked into assuming that installed services are the best. Don’t be excessively confident, and hear only what you need to hear. Don’t be shallow in your research. Don’t ever think that SharePoint will help to develop an intranet in an unreasonably short period of time, even with a trivial budget, or with a too small and poorly prepared team. Business analysis: Consider corporate goals and how the intranet will help in accomplishing them, and transform these into functional requirements. Administration and content management strategy. UX design and usability research so the outline might be iterated until the point when it functions admirably for representatives. Advancement, support, and preparing procedure. There is less chance for your SharePoint developer to be a decent UX developer. So you will require UX developers. In a perfect world, they ought to have a grip on SharePoint’s abilities. These UX developers should offer innovative inputs that are sensible inside the SharePoint environment. Try to be brainstorming but be realistic as UX plans progress toward becoming requirements. Also Read: How Intranet becomes a Gateway for a Digital Workplace? As a matter of first importance, your SharePoint developers should know the platform well. When you’re using a version of SharePoint that is new to the developers, designs play a key role and might be difficult as well. In these cases, the prototype and builds can delay the whole project. Allow additional time and training for development hiccups, particularly if you are using a version of SharePoint new to your designers. Choose the default set with care, as the employees will never change the default set of components they see and use, and pick the default settings as per the need. Improve the out-of-the-box My Site navigation, which can be confusing for employees. Promote My Site on the intranet, with the help of navigation menus, the landing page, and other related pages. With the help of such features, the employees can exploit the newsfeed, sites, tasks, applications, and different features that come with My Site. by reducing the set of web parts in the web-part gallery to distract the contributors from developing widely unique pages. Don’t make employees the administrators of their personal sites, to maintain a safe distance from catastrophic consequences, like, deleting their own site. Give cent percent of your time and resources in developing responsive designs, as reworking on the components of the standard SharePoint page can be a bit complex. SharePoint makes it simple to create team spaces by offering the task to non-designers to organize and manage the areas where people communicate. These areas can end up flourishing, breathing ecosystem that guides teams — or dull storehouses where data is old, copied, buried, and hard to find, particularly for users new to space. Workers should be well prepared about the collaboration spaces. Majority of the teams say it’s essential that the intranet has its own look– and– feel and doesn’t look like SharePoint, and to achieve this, visual designers were hired. However, they all required SharePoint developers to execute their branding and desired look. If your company management is active, it will inspire the users to be active on your intranet. For instance, a scenario where salespeople explaining the best practices or customer service people explaining how they overcome a difficult situation. These modes of interaction could improve sales and will influence employees to interact. Inspiring the employees will probably create the best content on your intranet. You can conduct a poll by asking someone to post an article, where the users can respond to. 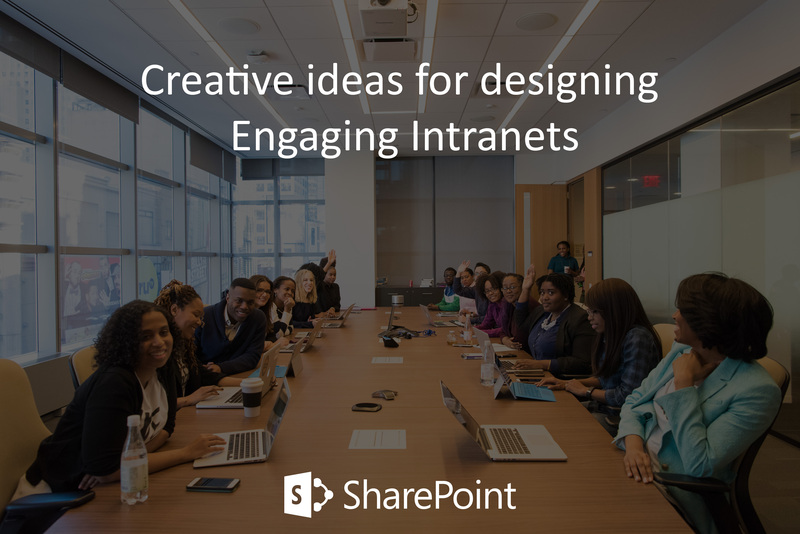 The sole motto of asking for Sharepoint intranet ideas to improve your intranet can lead to a huge upsurge in the daily engage rate of your employees. While developing an intranet, it is important to make sure that, it is available on every screen. This means people can utilize the intranet on any device, however, it effectively urges individuals to utilize it more often and particularly when they are on the move. Having any kind of obstacle to use will restrain peoples access, permissions and eventually leading to neglecting of few areas of your workforce. Everyone isn’t desk-bound throughout the day – some might be out, so they should have access whenever they have time and on any device they have. If you don’t have an intranet accessible to all, you’ll lose those people on the very first stage and they won’t be as engaged as others in your association. Some of the areas where the SharePoint gets low are the unplanned, unmonitored, unbridled clutters that cost cash, reduce employee efficiency, and affect employee motivation and confidence. In case your company has a poor SharePoint intranet service, there’s a lot to blame around. Keep in mind the insights gained from this post. These teams have developed and tamed the raw functionalities in SharePoint and eventually succeeded in developing outstanding intranets.